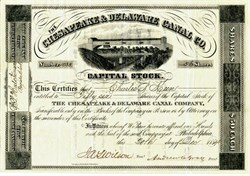 Beautiful uncancelled stock certificate from the Chesapeake & Delaware Canal Company printed in 1884. This historic document was printed by the Mann Company and has an ornate border around it with a vignette of the Summit Bridge above the canal. This item has the signatures of the Company’s President, and Treasurer, and is over 127 years old. Small pin holes in upper left corner. XF. The Chesapeake and Delaware Canal (C&D Canal) is a 14-mile (23-km) long, 450-foot (137-m) wide and 40-foot (11-m) deep ship canal that cuts across the states of Maryland and Delaware, in the United States. It connects the waters of the Delaware River with those of the Chesapeake Bay (the emptying point of the Susquehanna River) and the Port of Baltimore. The C&D Canal is owned and operated by the U.S. Army Corps of Engineers, Philadelphia District. The project office in Chesapeake City, Maryland, is also the site of the C&D Canal Museum and Bethel Bridge Lighthouse. As early as the 17th century, settlers to the New World realized the nation's growth through industry and commerce would depend upon economical transportation of goods across both land and water. In the mid-17th century Augustine Herman, a mapmaker and Prague (Bohemia, now Czech Republic) native who had served as an envoy for the Dutch, observed that two great bodies of water, the Delaware River and Chesapeake Bay, were separated only by a narrow strip of land. Herman proposed that a waterway be built to connect the two. The canal would reduce, by nearly 300 miles (500 km), the water routes between Philadelphia and Baltimore. The issue of constructing the waterway was raised again in 1788 by regional business leaders, including noted Philadelphians Benjamin Franklin and Benjamin Rush. In 1802, following actions by the legislatures of Maryland, Delaware and Pennsylvania, the Chesapeake and Delaware Canal Company was incorporated. More surveys followed, and in 1804 construction of the canal began including 14 locks to connect the Christina River in Delaware with the Elk River at Welch Point, Maryland, but the project was halted two years later for lack of funds. The Chesapeake Bay and Delaware River were now connected by a navigation channel measuring nearly 14 miles (23 km) long, 10 feet (3 m) deep, 66 feet (20 m) wide at the waterline and 36 feet (11 m) wide along the channel bottom. A covered wooden bridge at Summit, Delaware, spanned the canal across the "Deep Cut," measuring 250 feet (76 m) between abutments. The bridge floor was 90 feet (27 m) above the channel bottom. Three wooden swing bridges also crossed the canal. Locks to pass vessels through the waterway's various levels were constructed at Delaware City, Delaware and St. Georges, Del., and two at Chesapeake City, Maryland. Each measured 100 feet (30 m) long and 22 feet (6.7 m) wide and was eventually enlarged to 220 feet (67 m) in length and 24 feet (7.3 m) in width. Teams of mules and horses towed freight and passenger barges, schooners and sloops through the canal. Cargoes included practically every useful item of daily life: lumber, grain, farm products, fish, cotton, coal, iron, and whiskey. Packet lines were eventually established to move freight through the waterway. One such enterprise — the Ericsson Line — operated between Baltimore and Philadelphia, and continued to carry passengers and freight through the canal into the 1940s. The cargo tonnage peaked in 1872 with more than 1.3 million tons transiting the canal. The Ericsson Line of steamboats originated as steamers built for freight only, however, the line converted to passenger boats during the time of the Centennial Exposition in Philadelphia, as the demand for travel increased through the picturesque landscape of the canal. The Baltimore and Philadelphia Steamship Company, which operated the Ericsson line, built and furnished ships with seventy to eighty staterooms in addition to the freight facilities. In turn, these ships grew from less than one hundred to more than six hundred tons and greatly increased travel from Baltimore to Philadelphia. The Ericsson Line was named after its first ship, Ericsson, which was named after John Ericsson who developed the screw propeller that was installed on the vessel specifically designed for the Chesapeake and Delaware Canal. Ericsson was built at Reanie & Neafie’s shipyard in Philadelphia by Anthony Groves Jr. The ship was finished in 1843, was seventy-eight feet in length and weighed eighty tons. The ship began operations in 1844 under the direction of Captain Noah F. Ireland. The Ericsson Line operated out of Baltimore’s No. 1 Light Street Pier for seventy five years, serving passenger and freight demands throughout the waterway with thirty registered steamers. The Ericsson Line’s success brought utility and prosperity to the canal and acted as a magnificent impetus for the expansion of trade by means of its enlargement and successful vocation with the Atlantic Deeper Waterways Association of the Chesapeake and Delaware Canal. A steam operated pump was purchased in 1837 to raise water from Back Creek and in 1852 a steam engine and large waterwheel were installed at the pumphouse in Chesapeake City. Measuring 39 feet (12 m) in diameter and 10 feet (3 m) wide, the iron and wood waterwheel had 12 troughs which filled with water as it turned; the water then spilled over the hub into the raceway and into the uppermost canal level. By 1854 a second steam engine was in use. The two 150 horsepower (112 kW) engines consumed eight tons of coal daily while lifting 170 tons of water per minute into the canal. The waterwheel and steam engines remained in continuous use through the mid-1920s. In 1919 the canal was purchased by the federal government for $2.5 million and designated the "Intra-coastal Waterway Delaware River to Chesapeake Bay, Delaware and Maryland." Included were six bridges plus a railroad span owned by the Pennsylvania Railroad. They were replaced during the 1920s by four vertical lift spans and a new railroad bridge. Responsibility for operating, maintaining and improving the waterway was assigned to the United States Army Corps of Engineers, Wilmington (Del.) District. By 1927 the eastern entrance at Delaware City had been relocated several miles south at Reedy Point, Del. All locks (except the one at Delaware City) were removed and the waterway was converted to a sea-level operation at 12 feet (3.7 m) deep and 90 feet (27 m) wide. These improvements cost $10 million. Two stone jetties at the new eastern entrance were completed in 1926. The "new" canal opened in May 1927 with great celebration, yet plans already were underway for further expansion as the sizes of ships and amounts of cargo continued to increase. The Philadelphia District took over operation of the canal in 1933. Between 1935 and 1938 the channel was again improved — deepened to 27 feet (8.2 m) and widened to 250 feet (76 m) at a cost of nearly $13 million. The project was also expanded to include a federal navigation channel 27 feet (8.2 m) deep and 400 feet (122 m) wide for some 26 miles (42 km) in the Upper Chesapeake Bay, from the Elk River to Poole's Island. Through the years, as the sizes and tonnages of ships using the canal continued to grow, accidents and one-way traffic restrictions strained the canal's capacity. Between 1938 and 1950 alone, eight ships collided with bridges. In 1954 the United States Congress authorized further expansion of the channel to 450 feet (137 m) wide and 35 feet (11 m) deep. These improvements began in the 1960s and were completed in the mid-1970s. New bridges to accommodate highway traffic crossing the canal also became necessary as deepening and widening progressed. Two mechanical lift bridges at St. Georges and Chesapeake City, toppled by ship collisions, were replaced in the 1940s with high-level highway spans (the former, the St. Georges Bridge, has largely been bypassed by the new Chesapeake & Delaware Canal Bridge, opened in 1995). Two other high-level vehicular traffic bridges, Summit Bridge in 1960 and Reedy Point Bridge in 1968, were constructed as part of the 1954 improvement authorization. Thus the Chesapeake and Delaware Canal approached 175 years of service as a vastly improved waterway, far different from its 19th-century predecessor. Since 1933 the Corps' Philadelphia District has managed canal and highway bridge operations from a two-story white frame building on the canal's southern bank at Chesapeake City, Md. Cargo ships of all sizes, tankers, container-carrying vessels (all up to Seawaymax-classification), barges accompanied by tugboats, and countless recreational boats create a steady flow of traffic. Through state-of-the-art fiber optic and microwave links, dispatchers use closed-circuit television and radio systems to monitor and safely move commercial traffic through the waterway. Typically a Delaware River and Bay pilot boards a ship as it passes Lewes, Del., entering the Delaware Bay, and guides the vessel up the bay and into the canal to Chesapeake City. A Maryland pilot then takes over and continues the ship's transit into the Chesapeake Bay to Baltimore or Annapolis, Maryland The procedure is reversed for eastbound ships. At Chesapeake City a "changing of the pilots" takes place, while the pilot launch maneuvers alongside a vessel as it continues its journey without stopping. The pilots use the ship's gangway, Jacob's ladder or port entrance to climb aboard or leave the vessel. These issues are being addressed as the project continues through the three-year preconstruction engineering and design phase, which is being cost-shared with the Maryland Port Administration. Technical research, supplemented by extensive public involvement, will provide a strong foundation for decision making in any further improvements to it. Such efforts reflect the U.S. Army Corps of Engineers' commitment to enabling the Chesapeake and Delaware Canal to continue its leading role in serving the nation's North Atlantic ports. A full-sized replica of the 30-foot Bethel Bridge Lighthouse is located on on Corps property, a short walk from the museum. The original lighthouse was used to warn vessels of locks and bridges in the days before the 1927 canal changes made it sea level. History from Wikipedia, Collectible Old Stocks and Bonds (old stock certificate buyer and seller) and WWI Liberty Bonds Buyer.